Ok, so it’s Saturday afternoon, and I have just spent an obscene amount of money on chocolate for Easter, whipped up a strawberry shortcake, and marinated steaks to celebrate Katie coming home from university for the Easter Weekend with her new boyfriend in tow, and I have a few minutes to write. I picked up a picture book the other day that I fell in love with. It isn’t funny. It isn’t a tear-jerker. It isn’t a lot of things. What it is though, is a book that ought to be in the hands of kids. 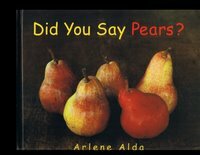 It’s a playful look at some of the oddball words in the English Language and is called Did You Say Pears? by Arlene Alda. It’s published by Tundra Books, in Canada. It’s the sweetest, by which I mean coolest, book of homonyms and homophones that you’ll ever come across, and questions are at it’s root, or should I say route. So if you are a primary teacher, this one needs to be in your bag a tricks. If you are an intermediate teacher, the photos could easily sell this book to your kids, and so could getting them to use this book as a jumping off point. And, of course, if you are just an ordinary adult like me who loves kids books, you’ll want it too, if for no other reason than to savour it on a Friday night before turning out the lights after you have had a rocking good time watching “What Not to Wear”. Rumour has it that I may not have an exciting life…This is absolutely and unequivocally untrue!